The best car wash in Changhua. Operated by a husband and wife team. Great service for a good price. Nothing but clean air and green everywhere you look. On the slow (oh so slow) train to Taidong. This fellow gets on, sits down and I swear in less than a minute fell into a deep sleep. 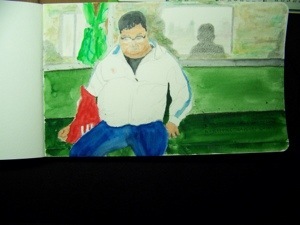 I started sketching him and noticed that my silhouette was perfectly framed in the reflection of his window. I felt this was a very cool thing to happen (cool things don’t happen to me very often) so I tried to emphasize the darkened shape of my reflection sketching him. I met this elderly gentleman while out and about. I sketched as my wife and he carried on a conversation. 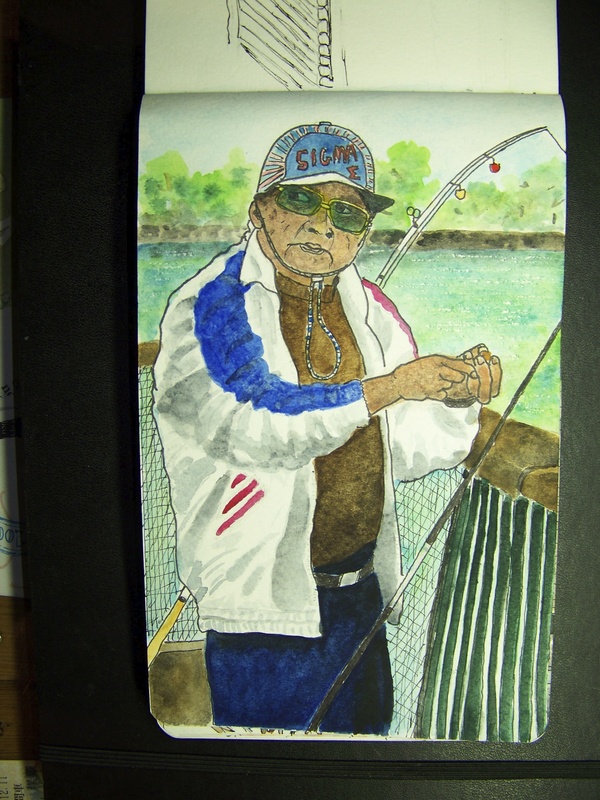 He was suffering from terrible arthritis but he told my wife he would continue to fish even if he had to bait the hook with his toes. Man, that’s the kind of passion I need to bring to my drawing. I liked the contrast between the “new looking” window shade and the rest of the house. A new window shade is a start-I guess. The weathered wood is still beautiful, but I couldn’t do it justice with my water brush. I was out sketching and this guy pulled up on his scooter, smiled, and gave me the victory sign. I immediately recognized that what I was seeing was the “Taiwan Spirit”. It is one of the things I love about this country and the people. No matter how tough times get, the Taiwan people never give up. This hard working man took the time to stop, give me a smile and the much used V sign. I grabbed my camera and asked him to do it again. 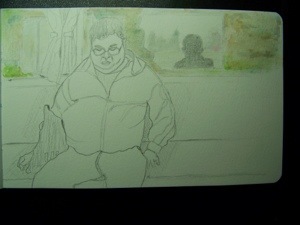 I had to draw this at my desk from a photo so it is not a pure urban sketch. Just a typical row of older houses in Changhua. Each one depending on and supported by the house next to it while also providing it’s own support. Kinda like how we (as a people) should be. This blazing pink Volkswagon is a new addition to Bagua mountain. The color can be seen from outer space and the coffee is cheap and delicious. Just a hard working mom trying to make a go at it.